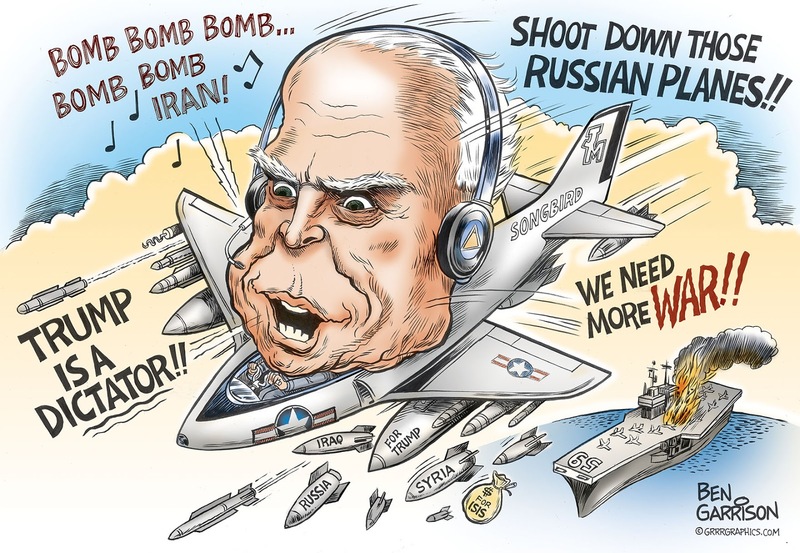 t’s time for John McCain to retire. It’s long past due. Forget what you read about McCain on Wikipedia and other state-sponsored sites. His history has been sanitized and covered up by the globalists. He recklessly crashed several planes because he enjoyed being a daredevil. His flying record should have gotten him tossed out of the military, but he knew he was immune due to his powerful connections. He wet-started his jet engine as a jape and it caused the plane behind him to fire a missile. McCain quickly dropped his bombs and ran below decks—never bothering to help in the fire-fighting effort. His bombs exploded and almost sunk the Forrestal. 134 sailors were killed and a helicopter whisked McCain away because many in the crew wanted his scalp. He sang like a bird while being a POW in Vietnam and disclosed highly classified information to his captors. To be sure, he did suffer broken bones and was bayonetted upon his capture, but when the North Vietnamese realized they had an Admiral’s son, he received special treatment. When he returned to America, he cruelly divorced his wife, who was hospitalized for a long while after a car accident. He then married a rich woman who could fund his political ambitions. Once in power, he then systematically voted against veterans and MIAs. Trump was right to speak out against McCain, and now the senator harbors a grudge. 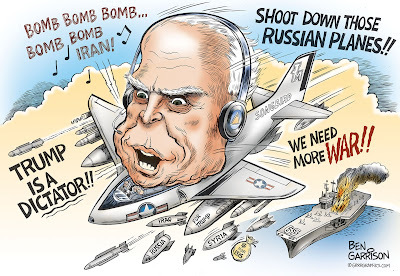 The anti-vet, warmongering McCain needs to retire before he causes more grief.